As noted in recent blog posts by Forbes contributor William Pentland and the New York Times’ Andrew Revkin, it’s instructive to look at where the lights stayed on during Hurricane Sandy to understand what makes certain places more resilient than others. 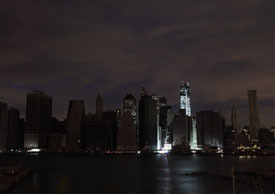 While 8.5 million customers lost power during Sandy, a small number of facilities (including residential buildings, hospitals, universities, and public service facilities) kept their power, heat, and critical equipment running. These facilities were able to do this because they used a technology called combined heat and power (CHP), a suite of highly efficient technologies that can run on a variety of fuels. Unlike traditional backup generators, CHP systems typically provide heat and power to facilities during regular operations. They tend to use natural gas and highly efficient turbines and engines to serve their very local loads, but they can also use biomass or biogas, which can be equally as reliable in times of disaster. A CHP system kept the heat and lights running for the over 55,000 tenants of New York’s middle-income Co-Op City housing complex. And it wasn’t just Co-Op City residents. For four days, a CHP system provided all 290 units in a Manhattan residential complex with all its heating, water, and electrical needs, including elevators, until the grid was back up. Though typically home to about 720 residents, the building nearly doubled its population after Sandy as those without power sought refuge among friends and family who lived there. Contrast that with New York City’s public housing facilities, which are often well-suited for CHP, where residents went up to two weeks without electricity and over 15,000 of them were still dealing with no heat or hot water well after that. Long Island’s South Oaks Hospital relied fully on its CHP system when the hospital pre-emptively disconnected from its soon-to-fail local grid—a repeat of its successful reliance on its system during the 2003 blackout. Connecticut’s 371-bed Danbury Hospital kept critical facilities running with its CHP system. And while NYU’s Langone Medical Center did not have a CHP system and notably had to evacuate all 215 of its patients when its existing backup plants failed, it was already planning on investing in one as part of a major energy upgrade. That investment will help Langone weather any future Sandy-sized storms. The College of New Jersey disconnected itself from the failing local grid and powered its campus with its CHP system, as did Long Island’s Stony Brook University. So too did Princeton University, which used its system to meet its critical on-campus loads for several days when the grid went down. The part of NYU’s campus connected to its CHP system kept its heat and power. Most of the student and faculty housing, though, is not connected and was without heat and power for some time. New Jersey’s Bergen County Utilities Authority (BCUA) used backup generators and its biogas-powered CHP system to safely process all the sewage of its 47 municipalities during and after Sandy. While other cities told residents to reduce water consumption as water treatment plants failed and raw sewage entered local watersheds for days, the 550,000 customers of BCUA were able to safely use water as normal. We’ve seen the importance of CHP in the face of hurricanes before, especially during 2005’s Hurricane Katrina. Louisiana State University never lost power and was able to function in a largely normal fashion immediately after the hurricane due to its natural gas-powered CHP system. For over 50 hours, the CHP system at the Mississippi Baptist Medical Center in Jackson, Mississippi met nearly 100% of the 624-bed hospital’s power, air cooling, and hot water needs while the grid went down around it. Facilities that can offer power, heating, and cooling at critical times can also double as places to house those who are without. During Sandy, New Jersey’s Salem Community College leveraged its CHP system to provide needed electricity and heat to the facility, enabling it to function as the county’s only Red Cross emergency shelter. The blackout of 2003 yielded similar stories. CHP can play an important role in increasing local resiliency in the face of worsening weather and grid outages, and mitigating increased grid vulnerability due to transmission over long distances. Government leaders are increasingly recognizing this. That’s why hurricane-prone Texas and Louisiana have recently passed bills requiring critical government facilities to conduct feasibility assessments for CHP when buildings are built or undergo major renovation. Communities should be thinking seriously about how to use more resilient technological approaches such as CHP in the face of more volatile weather caused by climate change. Highly efficient CHP is a win-win-win: facilities save money, reduce their energy use and emissions, and hedge against disasters.